The month of April marks the 10th annual Safe Digging Month, reminding people to call 8-1-1 three days before they break ground on any digging projects. By calling 8-1-1, contractors and residents can be informed of what utility lines could be damaged during an excavation project, so they can be flagged accordingly. At Victaulic, we like to use Safe Digging Month as an opportunity to reinforce safe excavation practices. When working on large infrastructure projects that include buried applications, it is important to work in the safest possible way. Limiting personnel time in enclosed spaces, and avoiding unnecessary risk is paramount. This year during safe digging month we are reminding everyone of the risks associated with welding buried pipelines versus the use of grooved mechanical joints. When working on a large buried pipeline, the process of excavation can be dangerous. Fall risk is high due to deep trenches, and soil stability can lead to on-site disasters. These hazards, along with the risk of damaging utilities (remember to call 8-1-1 before you dig), cause teams to want to keep excavation sites as shallow as possible, without compromising the integrity of the system. With a welded pipeline installation, deeper excavation is required, as installers have to get under the pipe to achieve a proper weld. Before welding can even to begin, crews must remove flammable materials from trenches, provide proper ventilation, wear the required personal protective equipment, and have fire watch in place. The welder must have clearance around him when welding, halting additional work in the trench until welding is complete. The trenches remain open an extended period of time, because welding the underside of the pipe must be completed upside down and on an uphill slope. To mitigate these risks, many projects turn to grooved mechanical coupling systems. Victaulic grooved mechanical couplings are designed with only two housing segments and require only two or four bolts and can be tightened from above, making grooved pipe joining both faster and safer than welding. Once excavation is complete, joining the pipe can cause a slew of other problems. 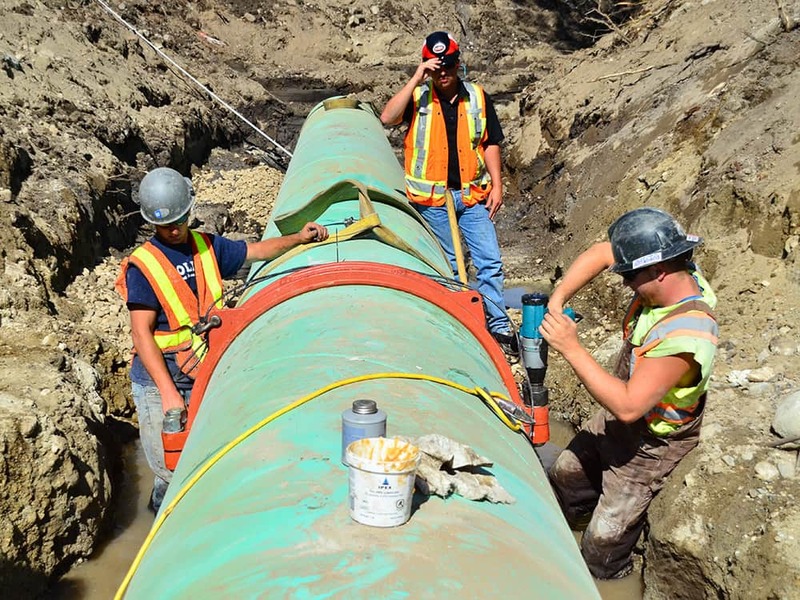 Pipelines must be aligned with each joint properly installed, to ensure that everyone on site is safe and the pipeline operates without any leaks or issues. Mating up pipe on a large diameter pipeline is very difficult. The pipe must be level and remain aligned throughout the entirety of the welding process. Installers are in turn bending over frequently, and lifting materials often throughout the lengthy fit up process. Grooved pipe joining technology can alleviate many of these risks. By using self-aligning grooved mechanical couplings, installers can easily push the pipe into a gasket, tighten the bolts bringing the housing bodies’ pad-to-pad, and confidently know that the system is properly aligned. This, in turn, reduces the risk of improper installation and improves job site safety. Installation isn’t finished until the pipe has been properly welded and coated or wrapped for corrosion resistance. When the weld on each pipe joint has cooled, protective coatings are applied via a spray or wrap on the job site, because the weld would damage the coating if it were applied in advance. This process is time-consuming and exposes welders to fire risk and fumes throughout the length of the project. In contrast, grooved coupling installation can be completed with a hand or impact wrench, and requires no fire watch or hot works. The grooved pipe and grooved mechanical couplings are delivered to the job site pre-coated for corrosion resistance, alleviating exposure to fumes and sprays. Safe Digging Month is more than just 8-1-1 at Victaulic. 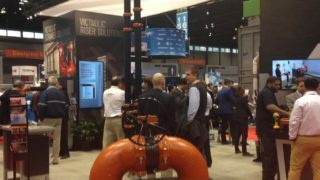 It gives us another opportunity to reinforce the safe job site practices that come with choosing grooved pipe joining. Buried pipelines come with a host of risks, yet many of these hazards can be avoided by using smart pipe joining methods. Interested in learning more about Victaulic’s buried solutions, check out one of our more recent innovations, our differential settlement joint. And always remember to call before you dig! Bradd Ripley, Senior Engineer at Victaulic, a manufacturer of mechanical pipe-joining and fire protection systems. A 13-year Victaulic veteran, Ripley specializes in large-diameter and dynamic movement solutions in the Infrastructure market. In his current role, Ripley provides training and technical expertise on Victaulic products throughout a vast array of applications. Prior to joining Victaulic, Ripley served as a project manager for Mears Group CPG, LLC, where he managed long line continuous anode as well as remote ground bed installations for natural gas pipelines. Ripley is a member of AWWA, ASCE, SME, and holds a BSME from Michigan Technological University. Gas is extracted using vertical wells and a vacuum system and transported to the gas-to-energy plant via HDPE pipe before being converted into power. Interested in the top six mechanical retrofitting best practices? Tip 5: Implement Modular Mechanical Room to Improve System Efficiency. Interested in mechanical retrofitting best practices? Learn about the top six here here. Tip 4: Maximize Jobsite Productivity. © 2019 Victaulic Company. Todos los derechos reservados. Usamos cookies para ofrecerle la mejor experiencia en nuestro sitio web. Para ver más detalles, haga clic en Conocer más.